Located directly across from the Gondola station for a free ride into the Mountain Village Core or to Telluride. There is one reserved parking spot in the private garage. 12 Trails Edge is located on a private ski easement, with ski-in ski-out access to Chair 10. The location still shines in the summer, surrounded by hiking and mountain bike trails. 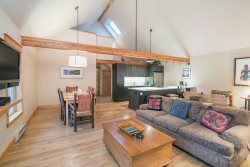 Fully equipped kitchen, beautifully furnished through out, and a private hot tub. Step off the elevator directly into your unit. No hallways and no walls are shared with other units in the building. Two twin-sized beds and a flat screen TV. Perfect for the kids!